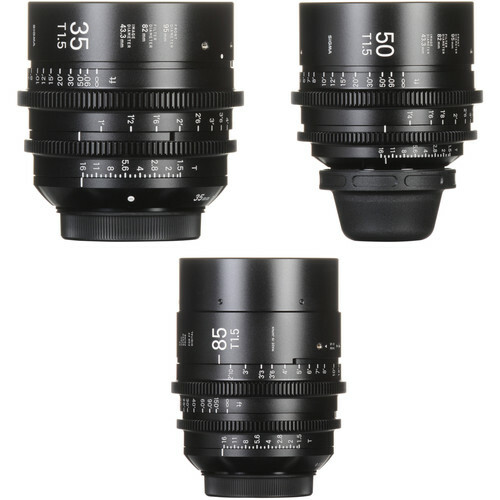 This B&H Kit of three Sigma T1.5 FF High-Speed Primes includes 35, 50, and 85mm PL-mount lenses, providing a core trio suitable for up to 8K capture. Each lens in the bundle covers full-frame sensors, has an aperture range of T1.5 to T16, and has a focus scale marked in feet. Lens features include cine-style focus, iris and zoom gears, a common 95mm front diameter to accommodate quick lens changes when using accessories, and a 9-blade iris for smooth bokeh effects.